I've been keeping a bit of news from you - I start a new job on Monday! My time off (aka "funemployment") is officially coming to an end. I'm ready for it though - the job is in public health, which is a field I have been wanting to enter for a while, and I'm really excited about it. Anyway, I bring this up because even though I sometimes wonder if I have too many cookbooks, I still bought myself two more to celebrate getting the job offer. One of these was Claudia Roden's The New Book of Middle Eastern Food. Ever since our trip to Turkey, I've been very interested in exploring the food of the Middle East, particularly the mezes. 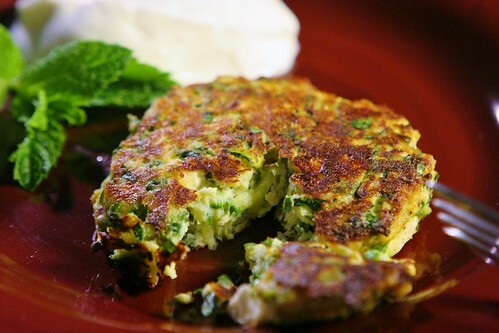 The first recipe I decided to try was for Turkish zucchini fritters. Shredded zucchini and onion are mixed with herbs and feta cheese to make the batter, and then the fritters are pan fried. These fritters have a thin crisp crust, but are very soft and melty on the inside, due to the cheese. I especially love the addition of mint to the batter. For those of you looking for new ways to use up a bumper crop of zucchini, give this a try! Do not make this batter ahead of cooking time. The vegetables will continue to release water and the batter will get soggy. These cakes are very flavorful and can be served plain, or with a dollop of Greek yogurt. If you'd like to jazz up the yogurt a bit, stir in a crushed garlic clove and let it sit for a while to absorb the flavor, or sprinkle with fresh dill. 1 lb. zucchini, coarsely grated. Combine grated zucchini and onion with a large pinch of salt in a colander. Mix well and let sit for 20 minutes to let the vegetables release liquid. Squeeze as much water as possible out of the vegetables (you can squeeze one handful at a time, or else place the veggies in a clean dishcloth and wring it out). Preheat oven to 200 deg F. Combine drained vegetables with mint, parsley, red pepper flakes, feta cheese, and a few grinds of pepper. In a small bowl, beat together the egg and flour until well combined. Stir egg mixture into the zucchini mixture. Heat a large heavy skillet (preferably cast iron) over medium heat. Add enough oil to coat the bottom of the skillet. Add batter in 1/4-cup scoops to the pan and flatten the cakes with a spatula. Cook until browned, about 3 minutes per side. Transfer finished fritters to a baking sheet and keep them in the oven to stay warm while you cook the rest. Leftover fritters can be stored in the fridge for a couple days. Reheat in a 350 deg F oven until they are warmed through and the outside is crispy again. Congratulations on the new job! Zucchini fritters are all the rage on the food blogs this summer! I've seen about 5 different variations in the past couple of weeks. These look really good! Congrats (and yay public health - my field!). I'd be curious to hear about what you're going to be doing (if you're willing to share). On another note, I love that you added feta to these fritters! I prefer to keep the details off the blog, but I'll shoot you an email about it! These zucchini fritters sound so awesome, I wish I had some right now! Good tip about making the batter ahead of time. Yay! Mega congrats! I'm so excited for you! I would have bought myself congratulatory cookbooks as well...and it sounds like the purchases paid off because these fritters look delicious! These fritters look so great - I love summer zucchini!